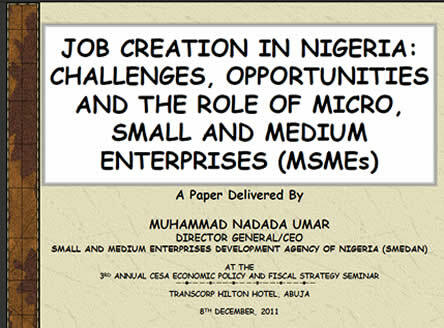 The issues of MSME development and job creation are key in the present administration?s economic development efforts. This is one way of delivering the dividends of democracy and thereby stemming the tide of restiveness and insecurity in the nation. In realizing this, the Government has been trying to establish structures to ensure that the business environment is conducive for the private sector to thrive and create jobs. Entrepreneurs/MSMEs must be encouraged to drive the process of job creation as they are known, all over the world, as aggregate generators of employment. Recently released inflation rate report by the NBS shows a further decline in consumer price index in December 2017. At 15.37 percent, the CPI was 0.53 percentage points lower than the 15.90 percent recorded in November 2017. The food sub-index decreased to 19.42 percent from 20.21 percent, indicating reduced pressure on food prices in the review period. Core sub-index fell slightly to 12.1 percent from 12.21 percent in the preceding month. Going forward, the ability of the Central Bank of Nigeria (CBN) to control inflation in 2018 may be hampered by monetary injections by the government and politicians towards budgetary expenditure and election campaigns, respectively.